Eric Meyer describes the uniqueness of Modello stencils including scalability, pattern selection, and more. In the early 1980s, manufacturers introduced heavy-duty paper stencils for concrete as an alternative to pattern stamping. Designed to be lightly pressed into the concrete surface, they offered a fast way to put repeating brick or stone patterns in large slabs, such as driveways and patios. 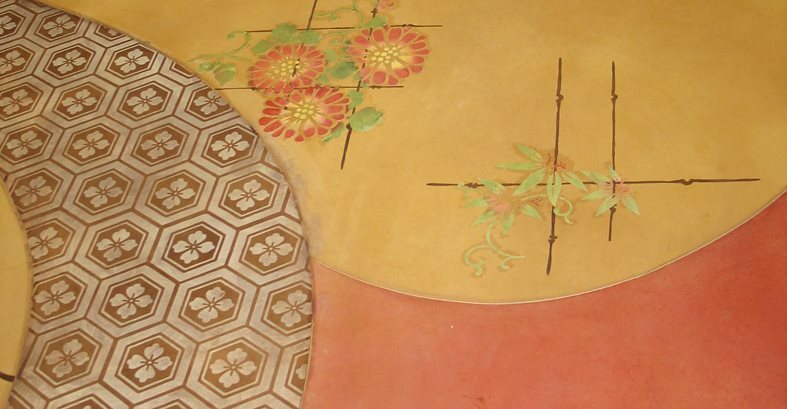 Though this stenciling method is still popular today, it can only be used with fresh concrete or concrete toppings, and the pattern selections are limited. 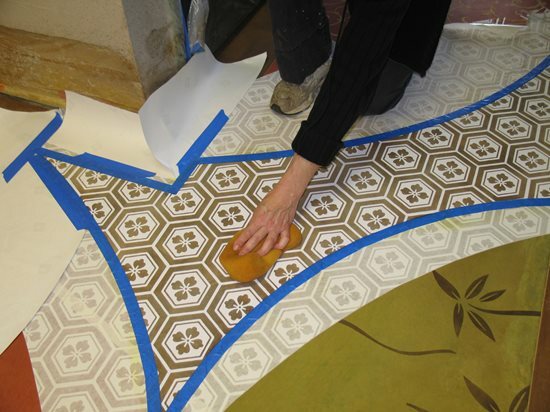 However, Melanie Royals of Modello Designs, National City, Calif., has developed a new approach to applying decorative patterns and designs to concrete—one that can be used on existing interior or exterior surfaces. Her one-time-use decorative masking patterns, called Modellos, are cut to order from an adhesive-backed vinyl. The adhesive keeps the patterns firmly in place on the concrete surface while the decorative treatment of choice is applied. When used with stains, dyes, thin overlays, or etching gels, Modellos permit an infinite array of special effects. Contractors are using them to embellish floors with decorative borders and medallions, tile patterns, and embossed or inlaid motifs. 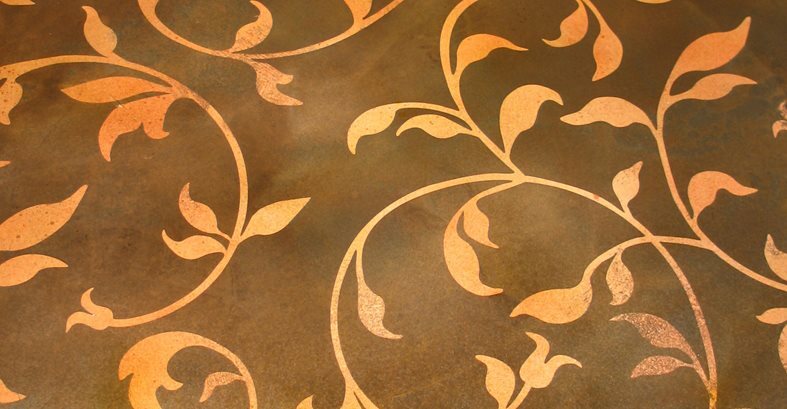 Design it your way Modello, an Italian word meaning "pattern" or "I model," is a fitting name for a stenciling material that can be completely customized to suit individual design needs. "We offer nearly a thousand standard decorative patterns, but about half of our business is custom," says Royals. Her staff of graphic artists can alter a standard Modello pattern to meet customer design preferences or create a custom Modello from scratch to replicate customer-supplied art—a service called "Design on Demand." They can work from line drawings, photos, monograms, and logos. They can also adapt patterns from fabric, wallpaper, or carpet samples. "With adhesive masking patterns, you can explore designs not possible with traditional stencils. Instead of breaking up the lines of the pattern with connecting bridges, Modellos permit very intricate, detailed designs with continuous lines and scrolls because the design is held together by a transfer paper," Royals explains. Each Modello pattern is scaleable as well, and can be sized to fit the exact dimensions of each project. Recently, the company introduced Floor Frames and Concrete Carpets, a series of coordinating Modellos that incorporate borders, corners, and medallions to create a customized floor treatment. "Just give us the floor dimensions (length and width), and we can custom size the patterns to fit the space," says Royals. Modellos also offer the option of using the pattern for positive or negative design effects. 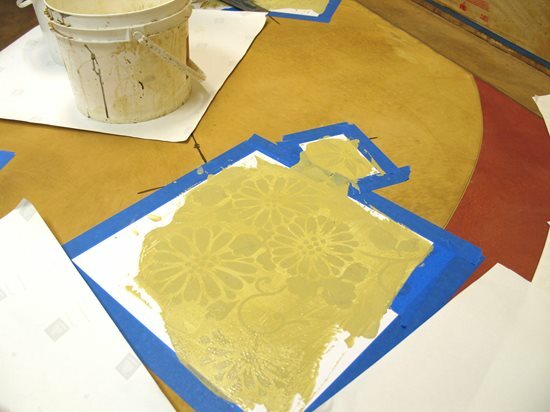 As the machine cuts the pattern, the stencil goes through a process called "weeding," or removal of the areas where the decorative treatment will be applied. When the positive areas are removed, the decorative medium fills the open areas to produce a positive design. A negative weed removes the areas around the design so the design itself becomes a mask or resist. "It's like turning the pattern inside out and approaching it from a different perspective. When embossing, for example, a negative design will produce an inlaid pattern while a positive design will produce a raised pattern," Royals explains. What you can do with Modellos Thanks to their tenacious adhesive properties, there are few restrictions in how you can use Modellos to add pattern, texture, and color to concrete surfaces. Each Modello consists of three separate layers: the precut decorative masking pattern, a backing of waxed release paper, and a top layer of translucent transfer paper. The transfer paper stabilizes the cut design and stays in place until you remove the release paper and securely affix the Modello to the concrete surface. Once in place, a Modello won't budge even if you trowel over it or lightly sandblast the surface. This ensures that whatever treatment you apply will affect only the exposed areas, with no risk of "run-unders" beneath the stencil and blurring of the pattern lines. Applying color with chemical stains or water- or solvent-based dyes, either before or after the Modello is removed. 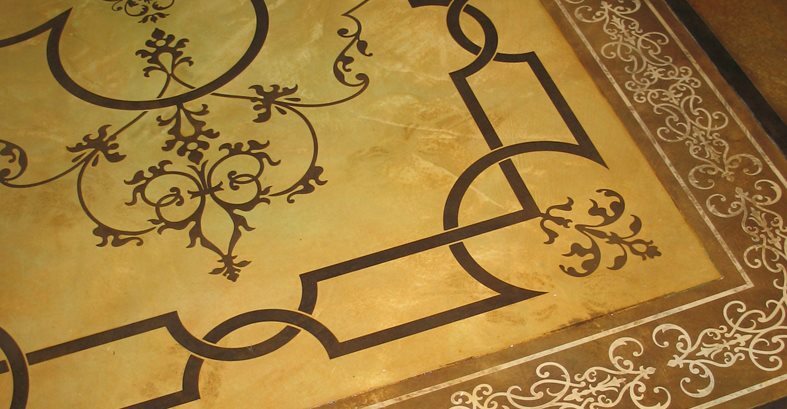 Embossing or inlays, produced by troweling or spraying a thin concrete overlay or plastering medium over the Modello. Etching designs into the concrete by lightly sandblasting or using an etching gel. Creative artisans often combine one or more of these techniques, such as staining first and then embossing or etching. You can also experiment by applying different coloring treatments to embossed or etched images. Royals says it's important when embossing to apply the medium just flush with the Modello so it remains visible for later removal. (Unlike stencil embossing, where the stencil is removed immediately, Modellos must remain in place until the embossing material has completely dried.) You can order Modellos in different thicknesses to achieve embossed reliefs ranging from 1/16 to 1/4 inch. To create a higher relief, you can build up multiple layers of material, allowing it to dry between coats. One of Royals' techniques for achieving interesting multicolor effects is to first apply a solvent-based dye over the Modello masking pattern followed by a solvent-based sealer. After removing the Modello, she applies a contrasting stain color over the area. The sealer acts as a resist so the stain only penetrates the sections previously covered by the Modello. The Value of Self-Expression The cost of a Modello depends on its complexity, size, thickness, and degree of customization. "On average, a stock pattern runs $7 to $9 per square foot, with custom patterns typically costing more. But considering the level of detail and self-expression you can achieve, the cost is very reasonable," says Royals. "The true value of Modellos is that you can accomplish simple to highly intricate decorative pattern work with ease to create an artistic concrete treatment that wouldn't have been possible with any other medium." Unlike traditional stencils, Modellos are not reusable, so you must order enough masking patterns to complete an entire project. But on elaborate jobs, this can be to your advantage, Royals explains. "With Modellos, you can lay out the whole design at one time. With traditional stencils, you would have to continually move the pattern repeats, which can take a lot of time." For more information on creative ways to use Modellos and for a schedule of stenciling workshops, visit www.modellocustomstencils.com. 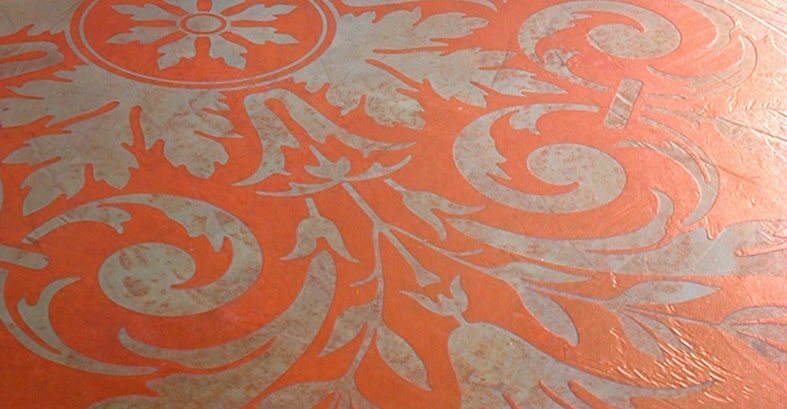 Synergistic Combinations The influx of new products on the market for coloring and texturing concrete has greatly expanded the creative possibilities with adhesive stenciling. Royals says she has achieved excellent results with the decorative mediums described below. In fact, she has partnered with the manufacturers of some of these products to conduct workshops demonstrating the various stenciling techniques. This polymer-modified cement coating is applied with a spray gun, like paint. "It works well for embossing because it goes on very thinly and uniformly," says Royals. You can also choose from over two dozen integral colors and apply acid stains to further enhance the artwork. Royals likens this product to Venetian plaster for floors. A proprietary blend of acrylic resins, portland cement, and other ingredients, SkimStone can be spread paper-thin with a straight-edged trowel. Generally, several coats are applied to create a textured appearance. You can custom tint each coat by mixing in the desired amount of liquid coloring agent. This super-gentle etching gel is used to remove previously applied acid stains within the design area, producing subtle to dramatic effects. It won't eat away at vinyl stenciling materials and is thick enough to be applied with a brush. Colormaker's Decographic concrete dyes are translucent, penetrating color solutions for use on existing concrete and cementitious toppings. They can achieve colors ranging from subtle earth tones to vibrant hues. 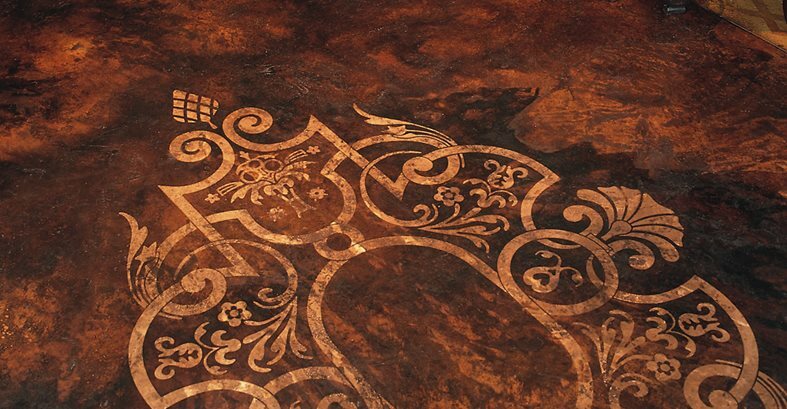 Their Sgraffino concrete overlayment can be trowelled over Modellos to create embossed and inlaid effects.